Figure A56. Maracaibo anomaly, interpreted as the Maracaibo slab, with (horizontal) [vertical] cross sections through (A)[D] the UUP07 p-wave) and (B)[D] the combined SL2013 and S40RTS s-wave models at 390 km; C) the location of the modern geological record that we interpret to have formed during the subduction of the slab. is located in the upper mantle below northern South America. It was first tomographically imaged by van der Hilst and Mann (1994), and was later recognized in tomographic models by Taboada et al. (2000), Bezada et al. (2010), and van Benthem et al. (2013). Van Benthem et al. (2013) shows that the Maracaibo slab has a shallow dip, and is at least 900 km long from the surface to the base of the upper mantle. Another 300 km may horizontally overlie the 660 km discontinuity. The Maracaibo subduction zone is interpreted as actively subducting Caribbean plate lithosphere that is overridden by the South American continent moving roughly W to WNW relative to the Caribbean plate, leading to oblique convergence along the NW South American continent (Kellogg and Bonini, 1982). Originally, the onset of Maracaibo subduction was estimated as ~45 Ma (Kellogg and Bonini, 1982), but recently, Ayala et al. (2012) showed that sedimentary basins in NW South America became fragmented because of uplift and deformation of the Maracaibo block as early as 58-55 Ma. Plate kinematic restorations of the Caribbean region (Pindell et al., 2012; Boschman et al., 2014) also show an onset of convergence across the Maracaibo margin around 60 Ma, and predict ~1200 km of subduction. This is consistent with the UU-P07 seismic tomographic image of van Benthem et al. 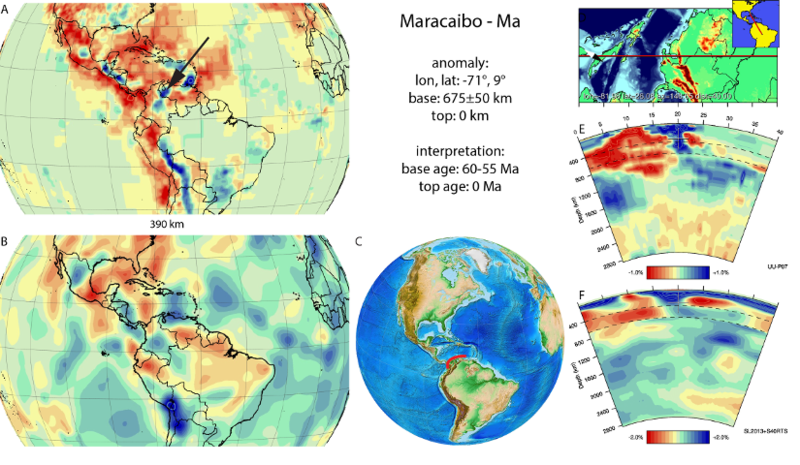 (2013) if the anomaly overlying the 660 km discontinuity is assumed to be part of the Maracaibo slab. We thus assign a 60-55 Ma age for the base of the Maracaibo slab.